These are lyrics by A Flock Of Seagulls that we think are kind of repetitive. 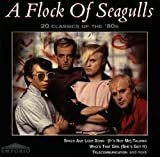 A Flock Of Seagulls', "The Story Of A Young Heart"
A Flock Of Seagulls', "Who's That Girl? (Shes Got It!)" She's Got It! She's Got It! She's Got It! Who's That Girl? Who's That Girl? Although A great song, there really isnt too much lyric diversity.